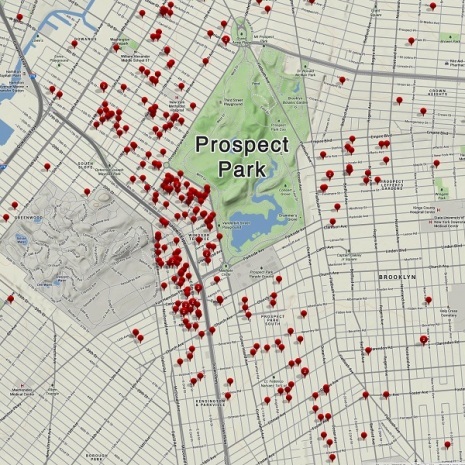 Map of Solar Assessments- Solarize Brooklyn! Just last week, we sent out an update saying that Solarize Brooklyn gathered over 375 solar assessment sign-ups by its deadline last week, Monday July 15th. The hundreds of sign-ups far exceeded expectations. This surge in interest is propelling this very successful project forward, therefore enabling the next steps to be taken. With the sign-ups in hand, Solarize Brooklyn can now arrange for solar installers to complete solar assessments on the participating buildings and give each viable household a proposal based on special Solarize Brooklyn pricing. Wondering where in Brooklyn the solar assessments are taking place? Below you will find a map of the 375+ assessments that will take place soon!